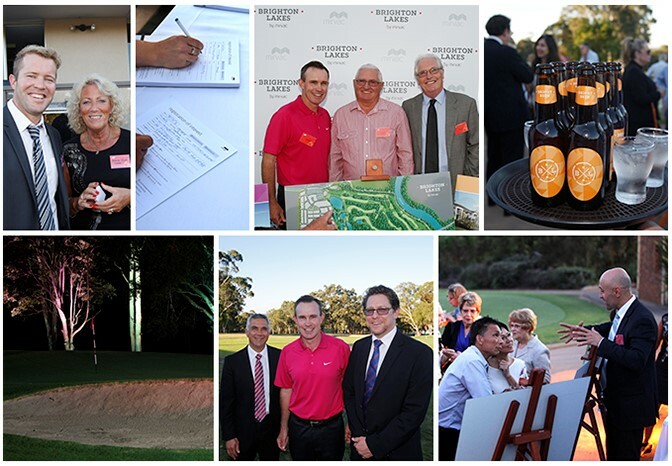 Members of the Brighton Lakes Golf Club were privy to a sneak preview of the new Mirvac masterplan community at Moorebank on Thursday 30th October, 2014. Brighton Lakes is proposed to include 300 Mirvac Homes, a community green with tennis court, swimming pool, children’s playground, open space, bike and cycle paths connecting the community and golf course to the Georges River. "Mirvac has been working with the club to find a way to make it the best facility in the south west and open up its potential as a thoughtfully designed residential community” said John Carfi, CEO, Group Executive Residential Apartments and Master Planned Communities. The loyal membership enthusiastically registered their interest to purchase on the evening after the keynote speech by Paul Gow, PGA Professional Golfer host of the Fox Sports Golf show and radio host. Special guests also included Ned Mannoun, Mayor, and Carl Wulff CEO, Liverpool City Council and Ray Woods, Chairman, Brighton Lakes Golf Club.